Rim is an Arabic name that means “white antelope” in Arabic. This antique natural coral necklace is simple yet chic and makes a striking statement. Natural white coral beads complement the Sudanese beads. These beads originate from the Mediterranean, the Straits of Malacca and the Red Sea, and were cut into beads between 1775 and 1925. Some of the beads have beautiful streaks of natural burnt orange, enhancing the character of this piece. These beads are separated by Tibetan daisy spacers. The Sudanese beads are inlaid with brass and copper wire and display the incredibly intricate craftsmanship of local artisans in South Sudan, using methods that are passed down from generation to generation; it is just one of many examples of the remarkably beautiful adornment that originates from this region. 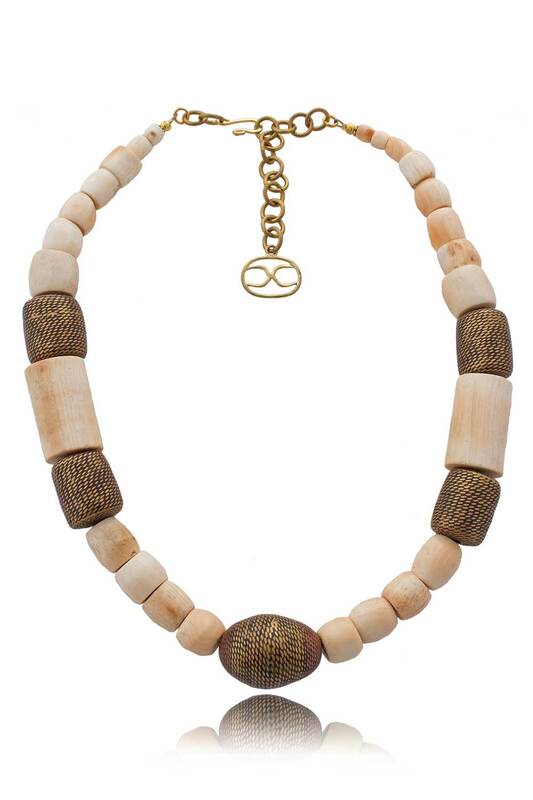 This majestic necklace is finished with a handmade brass clasp, chain and SHIKHAZURI bead. It will empower you with the ability to effortlessly elevate your look into one of bold sophistication.